Atchison coach Jim Smith is in his 19th season as Redmen head football coach. He has two daughters and one son, Adam, a standout strong safety and currently in his first full year as Atchison’s starting quarterback. Eighteen years ago, Adam was born on August 15, the first day of practice of his dad’s second season. Adam has enveloped himself in the program ever since. Coach Smith still remembers his son, as a 10-year-old ball boy, yelling at the defense with assignments and instructions during a contest. 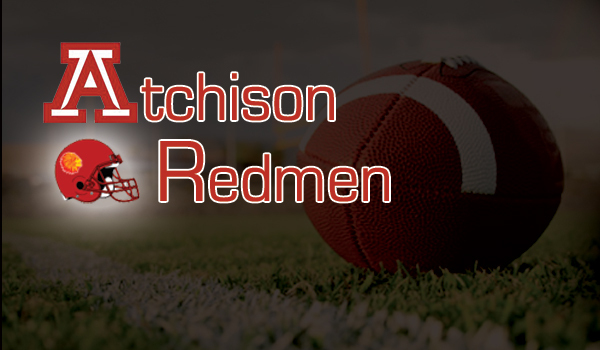 This fall, Adam Smith and a talented group of 13 seniors look to lead Atchison back to the playoffs after the Redmen finished 8-1 but missed the postseason in 2015. Last Friday, Atchison opened with a huge Week 1 victory versus Class 4A-II defending state runner-up Holton, 24-14. Atchison outscored Holton 10-0 in the final quarter as Smith accounted for 189 passing, 55 rushing and three touchdowns. From 2004-09, Atchison dropped five straight to Holton by an average margin of 22 points. Friday marked the first matchup between the schools in seven seasons. “A lot of people can’t share things like that with their kids,” Smith said. Last year, Atchison swept through the KC-Atchison League for the second straight year and entered a Week 9 matchup with KC Piper at 8-0. Atchison required a win or a loss by less than 11 points to secure a postseason berth. Instead, Atchison led 21-15 at halftime before Piper tallied 23 unanswered points after intermission. Atchison lost six starters in the game by halftime, two to the flu and four to injury. If Atchison had taken the district runner-up spot, the first round opponent would have been Bishop Miege, the two-time defending 4A-I champions. Atchison became the first team to finish 8-1 and miss the playoffs since Sabetha in 2007, according to Prep Power Index archives. Atchison’s only playoff berth since 2008 was a 6-4 season in ’12. Atchison, which had an average score of 44-18, enjoyed its most victories since a 10-1 mark in ’06. It marked the best scoring defense since ’06 and the top scoring offense in the last decade. The Redmen had just two turnovers and finished plus-23 in turnover margin. Atchison improved from 24.8 points per game and a plus-13 turnover margin in 2014. The Redmen have not reached the quarterfinals or better since a state crown in 1989, and are just on the outside of the 4A-I rankings heading into a Week 2 road matchup with K.C. Sumner Academy. This season, Atchison will again have the same district opponents with Tonganoxie, Basehor-Linwood and K.C. Piper. For 2016, Atchison graduated quarterback and two-time KCAL offensive player of the Year Wykeen Gill. Smith, the reigning league defensive player of the year, played some at quarterback as a sophomore when Gill was injured. On Friday, he helped Atchison to 400 yards of offense on 46 snaps, or 8.7 yards per play. In the last two seasons, the Redmen had averaged 4.5 and 6.9 yards per play in its base option offense. “I have always thought that he has done a very good job of reading the option,” coach Smith said. Coach Smith labeled his senior, depth-laden backfield “a good problem.” Five players carried the ball Friday: Smith, Dylon LeBlue, Fred Simpson, Austin Bonnel and Bryce Enzbrenner. Receiving-wise, Enzbrenner caught five passes for 145 yards and two scores. Junior Matt Schrick, a transfer from Maur Hill-Mount Academy, had a reception and a team-high 14 tackles. LeBlue, who has put on two inches and 25 pounds, finished with nine tackles. Senior Dai Coye Haley had eight stops with a tackle for loss, while Enzbrenner tallied three TFLs. Haley collected 64 stops (21 for loss) in ‘15. He has several Division II offers and one from the Ivy League’s Columbia University. Haley labeled himself a “defensive specialist” but Smith laughed and said Atchison “doesn’t have a defensive specialist.” Coach Smith asked Haley to play some offense this season, a role the senior has embraced. Atchison returned seven offensive and six defensive starters, including 6-foot-2, 250-pound junior Leighton Cushinberry, whom Coach Smith labeled one of the state’s best linemen. Senior Nick Kuhn is a two-year starter at center, and seniors Andrew Wilson and Joe Domann both start on the line. Defensively, Haley and junior Giovanni Burk start at tackle with senior Parker Welch and Enzbrenner at defensive end. LeBlue and Bonnel play linebacker in the 4-2-5 with Smith (team-high 103 tackles in ’15) at strong safety. Shrick and junior Tahj Helms are at cornerback, while senior Lamarca Tolbert is at corner, too. The top-four and eight of the top nine tacklers return from a defense that needed to improve against the run. In its season-opening victory versus Pleasant Ridge and its three district games, Atchison allowed 25.5 points per contest, along with 247 rushing yards and 6.5 yards per carry. Coach Smith said the Redmen needed to get better at reading their keys for 2016. The defense helped hold Holton’s run-heavy offense to 331 rushing yards on Friday, but just 116 yards came in the second half with 47 on one carry. After the win versus Holton, the Redmen enter KCAL play. Atchison has rolled through league competition the last two seasons, which has produced the worst strength of schedule in 4A-I in ’14 and ’15, according to Prep Power Index. Last year, the Redmen won league games 52-8, 62-6, 73-14, 39-18 and 54-14. Coach Smith said lack of playing four quarters is the biggest negative to the league slate. After a blowout, Atchison does more conditioning on Monday. In districts, Atchison was plus-15 in the first half, while minus-11 in the second half.